Stone Mountain State Park is 14,000 acres of natural beauty. Waterfalls, mountain streams, 17 miles of trout waters, 21 miles of pristine hiking trails and of course a 600 foot tall dome of granite are what awaits the visitor to the park. Words will fall woefully short in describing the setting of this magnificent National Natural Landmark. A few words that begin to paint the picture would be “breathtaking”, “amazing”, “picturesque”, “undisturbed”, oh and did I mention “breathtaking”. Really, the only thing to say is “you have got to come experience this”. Stone Mountain State Park is located in Wilkes and Alleghany counties, six miles southwest of Roaring Gap. From I-77 North, take Exit #83/Hwy 21 North/Sparta/Roaring Gap (you will exit from the left lane). Go north about 13 miles to Traphill Road/ State Road 1002, (you will see a brown state park sign) and turn left. Go about 4 miles to John P Frank Parkway (you will see a brown state park sign) and turn right. Follow the parkway to the park. From the west, take NC 16 to NC 18 in North Wilkesboro and then turn right onto Hwy 268 East. Go about 3 miles and turn left at Airport Road. Go about 4 miles and turn left this becomes Traphill Rd (SR 1002). Follow Traphill Rd to John P. Frank Parkway about 11 miles and turn left; follow the parkway to the park. The climb to the top of the Dome is not for the faint of heart, so do some walking ahead of time. In the past few years, a new, much easier path to the top of the Dome has been constructed, but it is still a pretty good hike with lots of elevation change. The old, awesome climb is a challenge to almost everyone, but it is well worth the effort. One word… breathtaking…. In every way! Water! Pack some cold water in the backpack for the hike. This is a long, time consuming hike that calls for refreshment as you go. I have packed a lunch several times and sat atop the Dome and enjoyed the view while I ate. Also, there are very nice picnic shelters with grills available for use, call ahead to reserve. Parking is available at two main lots, each of which is focused on the trail you are choosing. The Upper Trailhead Lot should be used for those that are looking for a more casual hike (still a pretty good hike and I recommend this trail for those that want to bring their dog with them). The Lower Trailhead Lot is to be used by those wanting the full Stone Mountain experience. 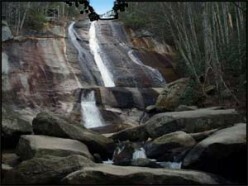 This lot gives you fairly easy access to the Hutchinson Homestead and the base of Stone Mountain Falls. Additionally, there is parking all along the Parkway where picnicking, creek wading, trail hiking and fly fishing is available. The map at this link is pretty good….. www.ncparks.gov/Visit/parks/stmo/pics/parkmap.pdf. So, print it out and carry it along for the day. As far as parking goes, I have never visited the park where I could not find a space; however, weekends can be pretty crowded. If you want to eat in the Park, bring your own food and beverage. Pack a picnic and enjoy the great setting the park has to offer. One of my favorite memories of Stone Mountain is picnicking beside a stream with my wife and two children, (ages 4 and 7 at the time), watching them play in the stream and make mud pies while I did some fly fishing downstream. If you don’t want to eat in the park, there is an awesome little country store on the Parkway before you enter the park (on the right side of the road). 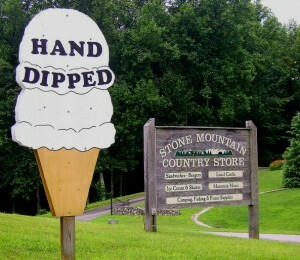 They have great grill food and plenty of hand dipped ice cream and ice cold drinks. The store is wrapped with a porch and they provide lots of old fashioned rocking chairs to enjoy the mountain breeze while you devour that cone of Cookies and Cream. (this is making me want to go right now) I really love to stop at this little country store and hate that I missed stopping there in the past. Dress in layers, you are in the mountains of North Carolina and you really don’t know what you are going to get weatherwise. Some days are scorching hot, some are perfect and others are downright chilly. Wear great hiking shoes. Don’t skimp on this, your feet will yell at you later. Wear comfortable clothes. Up and down hills, climbing steps and sitting on boulders calls for the right kind of clothing. Dress appropriately. Take your time. You will not cover this entire park in a day, so slow down and enjoy what you are doing. If there is a bench… sit on it. Someone before you determined that something needed looking at or thinking about, so do both. Getting in a hurry here can cost you more than time. Stay on the marked trails and off the slick rocks. Needless to say, there is danger at this park for those that choose to explore outside the designated area. Many have fallen to their deaths by stepping into the water at the top of the falls. Common sense is needed, if it looks dangerous, it probably is. Go home safe. Talk to people. Meet the folks that have come to the park. They are just like you. They love nature and can tell you about special things to watch for or which trail to take to see something. Be part of the Stone Mountain Park community and enjoy time with others. Drive the entire loop. Enter on the Parkway and leave by Long Bottom Road. I know you don’t want to get your car dirty, but the drive is worth it. Watch for trout. I love to hike beside the streams and watch for trout. You will be amazed where you will find them. Slow down. Enjoy the park. In my opinion, this park is the best thing northwest North Carolina has to offer. Don’t miss this! And don’t leave too early, the deer are in the meadows in the evenings. Drive slowly, the deer are everywhere. In closing, I want to make this plea to you. If you love nature and the great outdoors, don’t miss this park. “Stunning” is the word that comes to my mind. Whether you are a serious climber or a recreational hiker, Stone Mountain State Park offers endless days of pure outdoor enjoyment, oh and one more thing… The sunsets are amazing! 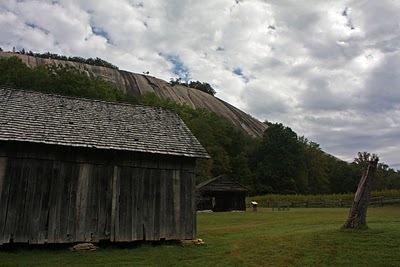 Stone Mountain is approx 35-40 minutes from Stone Mountain. Not a bad drive and MapQuest.com gives great directions.